Good Morning from a very snowy Whistler! We got hammered with snow over the past 48 hours and the snowplows and loaders are out in full force throughout the valley this morning. I reported last week that with very strong buyer activity right now and limited inventory, Whistler sellers are in a strong position to get top dollar. Our U.S. friends south of the border have really begun lighting up my phone and email with inquiries on Whistler properties in the past couple of weeks. Interesting times in the market ahead for sure. Now, I don&apos;t usually toot my own horn but just this past week my team and I were awarded with the MLS President&apos;s Club for 2015. We were in the top 1% out of over 12,000 realtors in all of Vancouver and stretching up the highway to Squamish, Whistler and Pemberton. 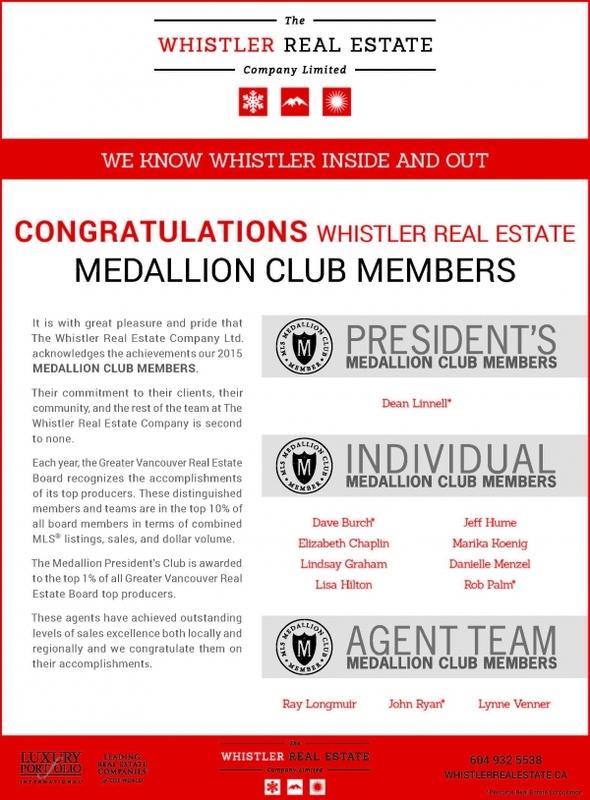 We helped 74 families buy and sell properties in Whistler and Pemberton last year. Our goal for 2016 is to help 100 families. It&apos;s not even the end of January and we&apos;ve already got 25 transactions on the books. Looks like another exciting year for The Linnell Group! The active listing inventory in Whistler & Pemberton continues to be a very low 409 active listings which is down by 8 listings from last week. Remember, our listing inventory continues to be at it&apos;s lowest point in over 10 years, the U.S. dollar versus the Canadian is at it&apos;s strongest point in over 10 years and we&apos;ve got record breaking snow conditions and skier visits in Whistler right now. If you own a home or condo in Whistler and you&apos;re considering selling, CALL ME. Your timing has never been better to get top dollar.